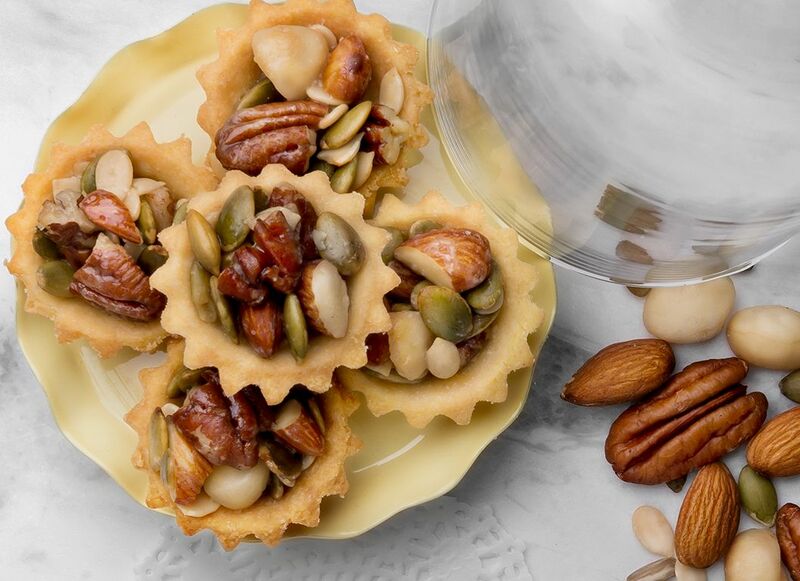 Inspired by the mooncake, the Pot of Gold Miniature Tarts are baked with melon seed, pumpkin seed, sunflower seed, whole almond, macadamia and pecan, held together by rich, gooey caramel. Recipe and photo courtesy of SCS Butter. Sift together flour and salt then fold into butter mixture. Rest dough for 30 minutes in the chiller. Divide dough into 10g each and press into 3.5cm greased tartlet mould. Make a thin layer and trim off the edges. Bake at 140°C in a preheated oven for 15 minutes. Remove tartlets from moulds and transfer to a baking tray. Mix all nuts and seeds together. Lightly toast in the oven at 150 degree for 10 minutes. Mix all ingredients in a pan and stir well. Bring to a boil. Combine all nuts and seeds into the caramel. Take 1tsp of the filling and place into the tartlet shell. Bake at 170°C in a preheated oven for 15-18 minutes or until golden brown.